3. Paint the feet black and the legs grey and let them dry while you work on the head. 4. To make the head paint the bottom side of a snack-sized paper plate and cardboard tube or TP roll grey and let them dry. Fold it in half when it is dry so that the grey is on the outside. Flatten one end of the roll and glue it to the head fro the trunk. 5. Cut out two ears shapes from snack-sized paper plates and glue them to the back of the head. 7. Draw eyes on a piece of card stock, cut them out and glue them to the head. 1. To make the elephant's body cut a cup (the part that holds the egg) off the egg carton. Cut a half circle shape out of the cup on the side that was the outside edge of the carton to make the leg shapes. (See picture to the right). 2. To make the head, trunk, and ears print out the pattern and cut it out. Place the pattern so that the trunk part covers one of the long center cones and each ear is inside a connecting cup. (See picture to the left.) Trace the pattern onto the carton and cut it out. You don't have to use the pattern; you can just follow the diagram to the right. 3. Color or paint the head and body if desired and add eyes. You can also glue on tiny wiggle eyes if you would like. 4. Glue the head to the body. 1. 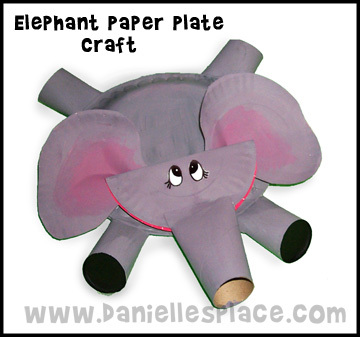 Print out the Elephant Head Pattern and Elephant Body Pattern and cut them out. 2. Color the body, head and trunk. Glue the body onto a TP roll. 3. Fan fold the elephant's trunk and then tape it onto the head. 4. Glue of tape the head to the body. Pass the Peanut Relay Game - Tell the class that they are going to pretend to be elephants. Give each child a sock to put on his or her hand (this is their trunk). If you have a large class break them in half or into teams. Give each team a peanut. The first team to pass the peanut to all the team members and back to the first player wins. If you have a small class just have the children pass the peanut from person to person until it comes back to the start. Use a timer to see how long it takes and then do it a second time to see if they can beat their time. Guess What is in the Box Game - Bring in a box full of different objects. Have the children take turns being the elephant. Children put socks on their hands and then reach into a box and try to guess what they are feeling with their "trunk". Elephant Walk - Did you know that elephants walk on their toes? The soles of their feet are made of thick elastic pads that flatten with each step. Because they are so big and weigh so much, this elastic pad gives them bounce in each step. Have the children walk on their toes. Then, try to do some pattern walking. Have everyone stand in a circle. Then, call out a pattern and have everyone walk that way around the circle. For example, step, slide, tiptoe, step, slide, tiptoe. Give each child the opportunity to take up the pattern. Katya Arnold teaches children and elephants how to paint. In her book she explains how elephants are a lot like the children she teaches -- they even like cookies. They love to wrestle, climb on each other, and act silly. They scream and even cry when they are sad. Just like children, each elephant is unique. They all have their own techniques when it comes to painting. Some elephants wrap their trunks around the brush to hold it, while others hold it inside their trunks. Some elephants drag the brush over the paper, while others dab. Some will paint for as long as an hour, while others are finished in just a few minutes. Most elephants don't paint real things, but they can be taught to paint trees and flowers. Many of the paintings are sold and the profits are used to help the elephants. Go to www.elephantart.com to watch videos of elephants painting and view their masterpieces. You can even buy one yourself! Paint Like an Elephant - Tape a large paint brush to the top of your children's hands to give them a different feel for the brush. 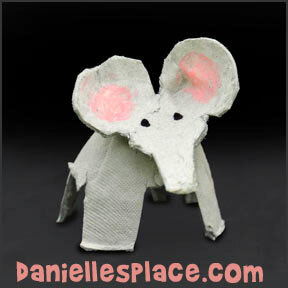 Encourage them to pretend they are elephants and use long flowing stroke and dabs of paint to make their pictures. *One elephant painting sold for $39,000! What you will need: One stick of pie crust mix, medium mixing bowl, measuring spoons, hot water, fork, wood board, all-purpose flour, baking sheet, 2 tablespoons sugar, 2 tablespoons ground cinnamon, and a shaker or spoon. 1. Have adult break the pie crust into little pieces in the bowl. Add 3 tablespoons of hot water. Mix with fork till the dough sticks together. What you will need: can biscuits (each child needs two biscuits) - cinnamon sugar - 2 raisins - a craft stick and the foil or baking paper same as above. 1. Practice Counting - Pretend to be elephants by putting a sock on your hand. Place a bowl of peanuts on the table. Grab some peanuts with your "elephant trunk". Count how many you can pick up. If your child can already count well, use this game to practice your addition facts. Pick up two handfuls of peanuts count each handful and then add them together. 2. Review Addition Facts with Peanuts - Show your child a certain number of peanuts in your right hand. Have him count them. (Use peanuts in their shells) Use your left hand to take a certain amount of peanuts from your right hand. Keep the peanuts you have taken hidden in your left hand. Show your child how many peanuts are left in your right hand. Let him count them. Ask him how many peanuts are hidden in your left hand. Let him see the hidden peanuts and count them to see if he is correct. Put both your hands side by side and have him count all the peanuts together. You can also write the math fact down after the child has counted the hidden peanuts in your hand. For example, start with four peanuts, have your child count them. Take away two peanuts and hide them in your other hand. Show your child that you have only two peanuts left in your hand. Let him count them. Then ask him how many peanuts you have in your other hand. He should say two. Open up your other hand and let him count them. Put your hands side by side and say, "Two plus two equals four" and then write the problem on a piece of paper. Put all the peanuts back in your right hand and do the same thing but pick up a different amount of peanuts and hide them in your left hand. Add more peanuts once your child has mastered a certain number of peanuts to make it harder. 3. Graphing Animal Crackers - Depending on the age of your children, make up a grid pattern. Give them a handful of crackers or use the whole box. Show them how to make a graph of the animals showing how many of each animal they have. If you have older children, they can also graph the 1/2 and 1/4 animals that are broken. 4. How Many Peanuts? - (Estimating) Bring in a jar full of peanuts. Ask the children to estimate how many peanuts they think are in the jar. Count the peanuts together. Who was the closest? Then, gather several other containers of different sizes and ask the children to estimate how many peanuts will fit in each container. 5. Measuring - An adult African elephant’s trunk is about seven feet (two meters) long! Have your child decide what he thinks is about seven feet. Cut a piece of yarn or rope that long or draw a line about 7 feet on the sidewalk. Use a measuring tape to see how close your child got to seven feet. Did you know that an elephant can run up to 35 miles per hour, it walks on its tiptoes, its trunk has more than 150,000 muscles, and it has a great memory? You and your children can find out these and even more interesting facts about elephants in this book. Have your children see if they can remember all the things the other animals did to try to keep the elephant from sneezing. Read "Engelbert the Elephant" by Tom Paxton - In this story Engelbert the Elephant really stood out in the crowd. Your children will love the story and the wonderful illustrations by Steven Kellogg. Is It Spelled With a "Ph" or an "F"? Have your child study the following words and write them on peanut shapes: Gopher, phase, phone, photo, nephew, dolphin, elephant, trophy, enough, foam, sheriff, effort, fudge, fume, focus, cuff, loaf. Mix up the peanuts and place them in a pile. Pick up the peanut on the top of the pile and read the word. Ask your child if it is spelled with an "f" or a "ph". If he says, "f", place it in an "f" pile. If he says, "ph", place it in a "ph" pile. When you have gone through all the peanuts turn over all the cards. See if any of the peanuts are in the wrong pile. Try again if your child missed some. Make Standout Elephant Displays That Compare the Two Types of Elephants - First read about the difference between Asian and African elephants. 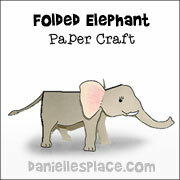 Print out two copies of the Elephant Display Paper onto card stock. Fold the papers in half on the dotted lines. Cut two slits in the paper at the two dark lines. Unfold the paper and fold it in the opposite direction, but leave the middle part folded in the same direction. Push out the middle part and fold the paper down creasing the paper at the short dotted lines. Your paper should look like the diagram on the right. Print out the Elephant Pictures and cut them out leaving a straight line at the bottom (See picture). Glue the elephants onto your display paper on the front of the rectangle that pops out. Have your child write the type of elephant on top of the paper and a description of that type on the lines below. Did You Ever See an Elephant? Spray water with her trunk? Eat peanuts with her trunk? Hug her baby with her trunk? Make Your Own Stuffed Animal "Trunks the Elephant" - No Sew - Kit With Cute Backpack!